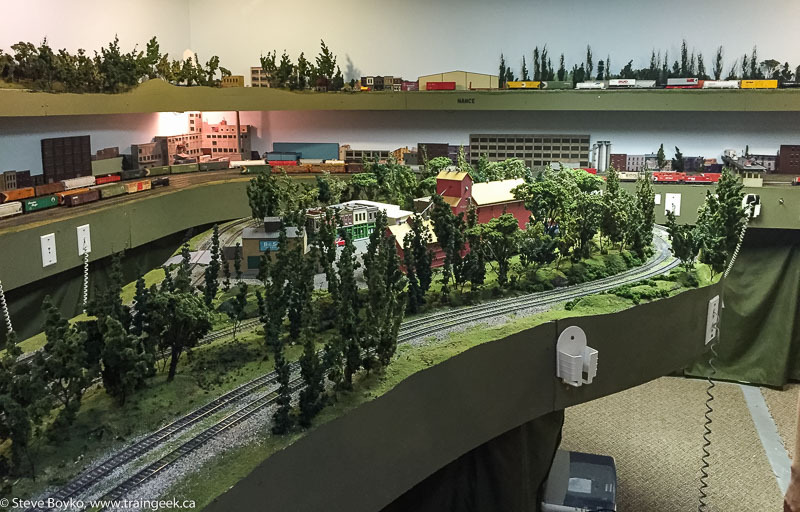 John’s layout takes up much of the basement of his home in the north end of Winnipeg. The majority of the layout is in one large room with staging in a side room. You can see his track plan here. The layout is stacked on two levels, with a “helix” connecting the two levels in the side room. It’s not really a helix in shape – it goes around a rectangular room – but it serves the same function. Winnipeg occupies 6 tracks on the top level and Duluth and Thunder Bay occupy the bottom level. You can see that John has a lot of SD40 / SD40-2 locomotives. 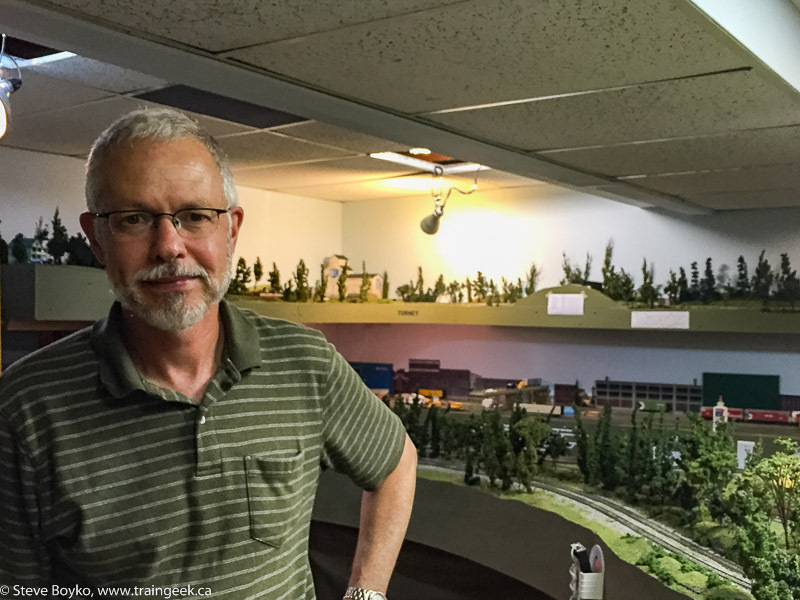 He models CP Rail from the early 1990s when the majority of their power was SD40 variants. 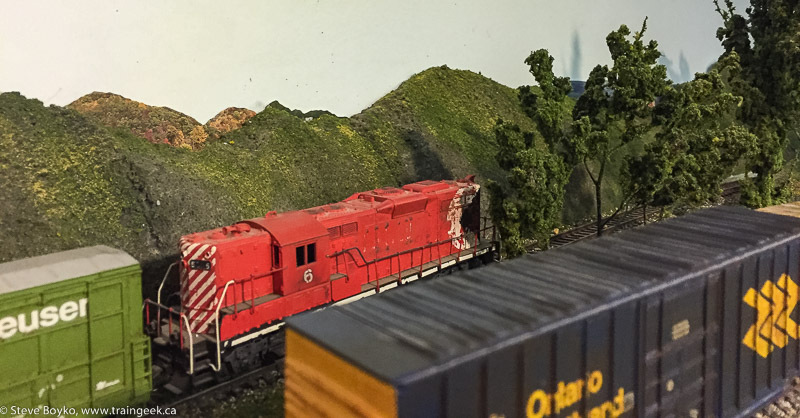 Recently he added a pair of gorgeous Bowser SD40-2 locomotives to his fleet. John’s layout used to have two levels in the central peninsula but he removed the upper deck a while ago. He has photos on the layout showing the “before” for reference, and a blog post too. I like the more open look that it has now. The bottom level can be set up for continuous running. 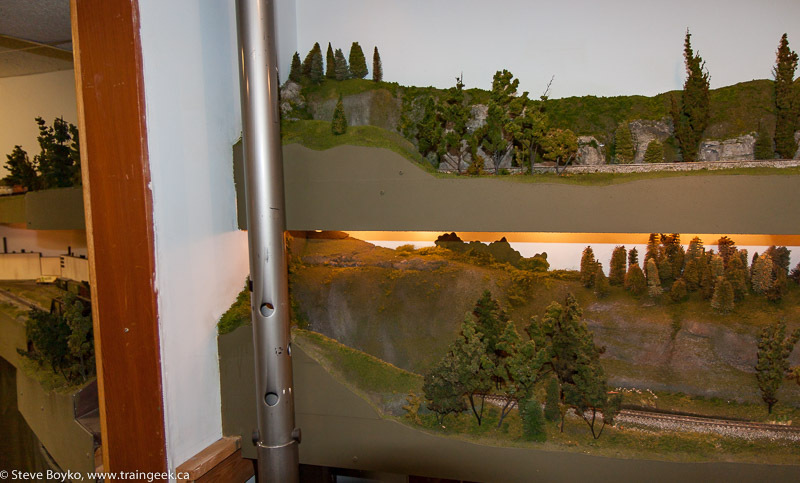 John sent several trains across the layout for our viewing pleasure and I took a little video of one of them. 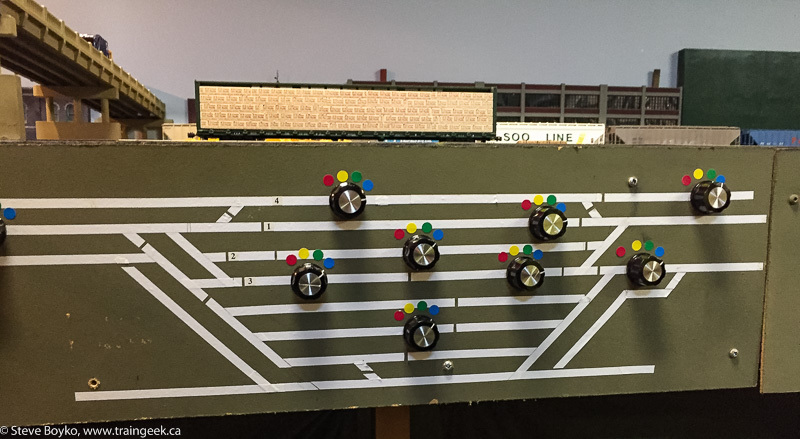 John uses DC for controlling his layout and he has four cabs set up so he could run four trains at once if required. He’s resisted DCC so far as he usually operates alone, and the expense of adding decoders to his large fleet is pretty daunting! He uses corded controllers, built years ago, to provide walkaround throttle control of his units. These are really handy and much better than being tied to a power pack. I took a little panorama with my iPhone to try to show more of the layout in one photo. Click on the photo for a larger view. John operates on his layout on occasion, on a formal or informal basis as the mood strikes him. His trains operate serially – first one train runs over the layout, then the next might go the other way, and so forth. One thing I really like about his layout is the abundance of industries to switch. 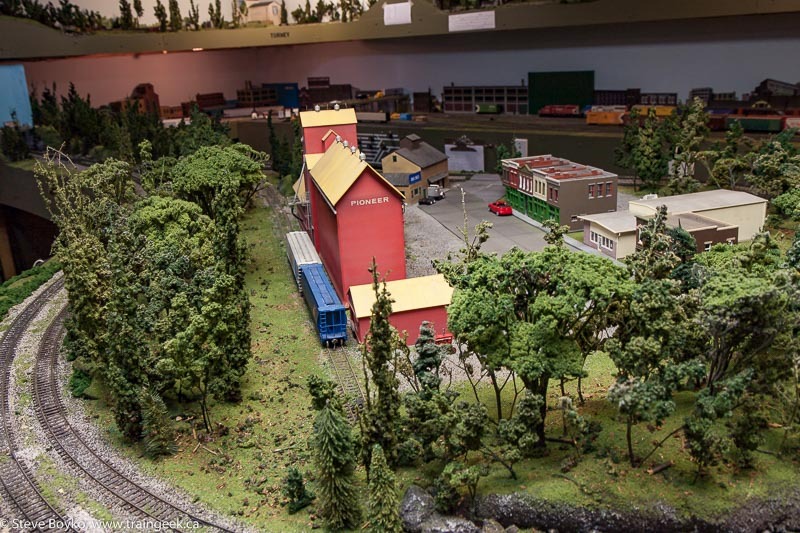 The large Peace River Paper mill occupies a corner of the layout, with an abundance of tracks and its own switcher. It is modeled mostly as a series of background flats, visible in the background of the photo below. The Fort Frances engine house and maintenance area are visible here too. John doesn’t use cabooses on his trains as he models post 1990 but I imagine these are here rusting away, or for special trains. There’s also a shortline connection to the fictional Peace River Northern, which uses an ex CP GP9 for power. This shortline connects to off-layout industries and interchanges with CP on the layout. The track basically goes off behind a ridge and disappears into staging but it provides a very realistic way for more traffic and more action. John uses a variety of “view blocks” to break the layout into different scenes. 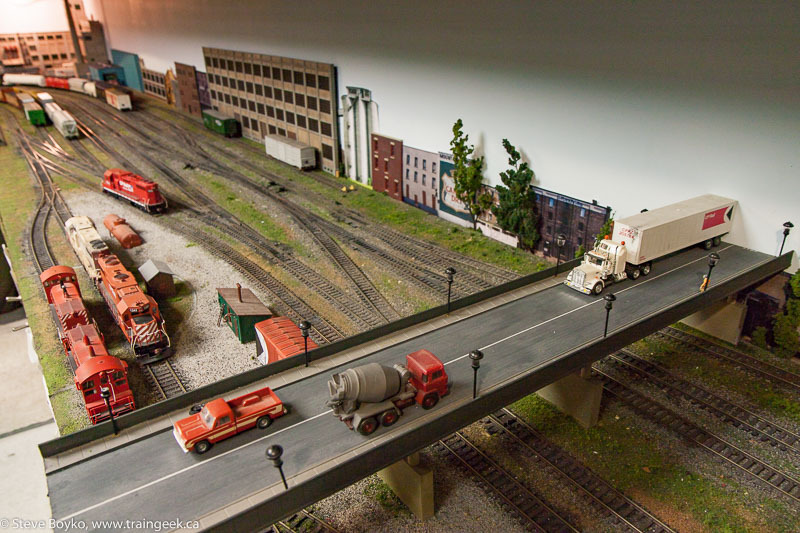 There are several overhead road bridges that cut across tracks to break up scenes and provide more viewing interest. In some cases the view blocks are forced by obstacles inherent to the house. Most Winnipeg houses have a few support posts in the basement that need to be accessible, but are often in the way. In my house I had them incorporated into walls with access plates to allow adjustments. John put a view block next to one post to work with the pole. I asked John what his future plans are. His layout is complete, so there’s no work to be done there. 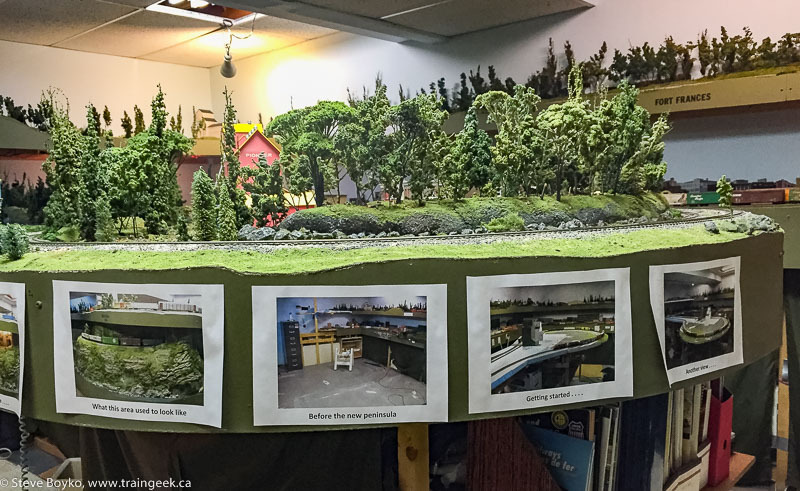 He has been working on a portable N scale diorama based in the Thompson River Canyon, in honour of his late brother Ken Epp. John has shared this on his blog and I saw the work in progress in another room. 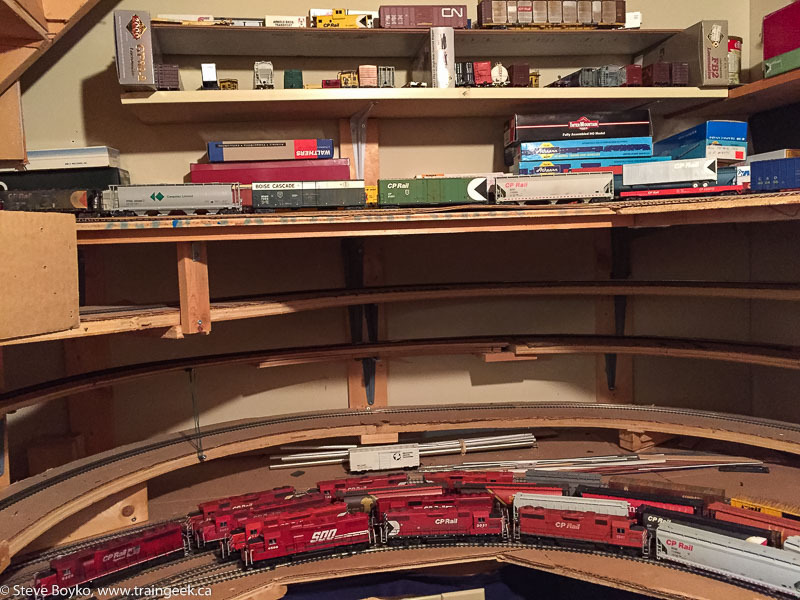 John is considering moving/downsizing in a few years, so his layout will be demolished at that time. It will be a shame for this beautiful layout to be destroyed, but all things come to an end and it may provide a great opportunity for a new start. 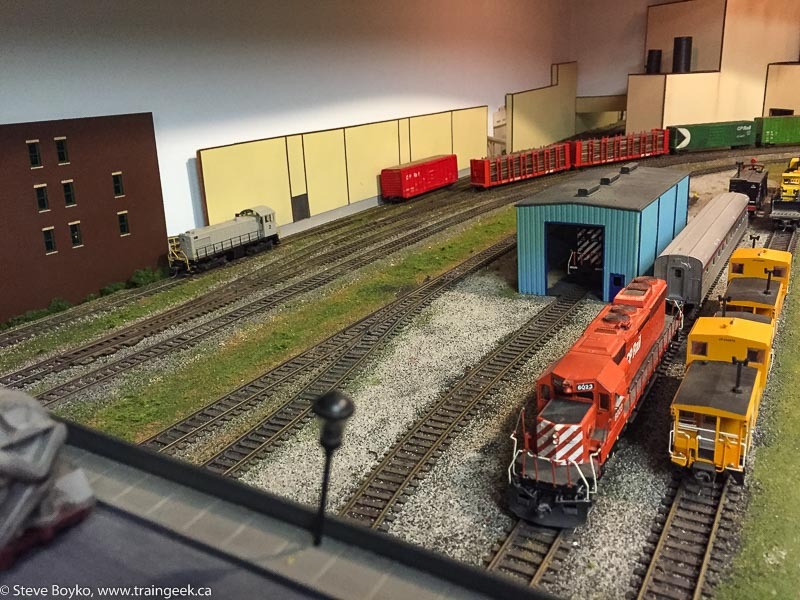 Thanks, John, for the tour of your fantastic layout!